The Accidental Prime Minister is based on the 2014 memoir of the same name by Sanjaya Baru. 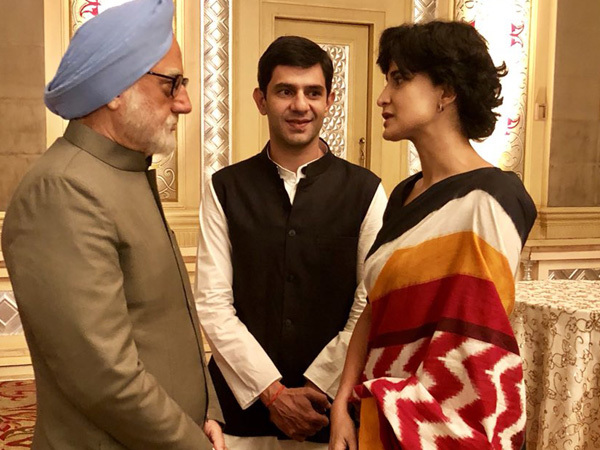 The trailer of Anupam Kher's much-awaited film The Accidental Prime Minister released today. In the film, Anupam will be seen stepping into ex-PM Manmohan Singh's shoes. Talking about his character, Anupam said that initially, he didn't want to be a part of his forthcoming film as he thought that it will be a politically controversial film. Anupam Kher was interacting with the media at the trailer launch of 'The Accidental Prime Minister' along with his co-actor Akshaye Khanna, producer Jayantilal Gada, Sunil Bohra and director Vijay Ratnakar Gutte on Thursday in Mumbai. "I thought it will be a political film and I didn't know what will be there in the film. The other thing is that it is not easy to portray Dr Manmohan Singh because he is an active political personality. This film is not based on political figure who belonged to 1960s or 1970s era. When Viay (Gutte) and Mr Bohra (Sunil Bohra) came to meet me so, for the first one or two months, I told them that I didn't want to be part of it." Kher added that the role of Dr.Manmohan Singh challenged him as an actor. "One day, I saw Dr. Manmohan Singh walking from one place to another on the television. So, the actor inside me told me if I could walk like him. But I was a disaster. That challenged me. I rehearsed his walk for 45 minutes but I couldn't get it right so, I called the makers for the narration of the script and I was very fascinated by it. I feel everything is difficult about Dr Manmohan Singh. He has very monotonous voice and yet there has to be variations then, I said yes to the makers of the film." Talking about preparations he did to play role of Dr Manmohan Singh, Kher said, "I took about 6-7 months to prepare this role. I must have seen at least 100 hours of footage but the most difficult was the voice part of it because he has a typical voice. Then I told myself that if your work is not challenging then, what's the benefit to do it? When asked whether he is worried that this film can be opposed by Congress as makers have shown a controversial relationship between Dr. Singh and his Congress party, he said, "I feel you have to be little more careful because people take only two minutes to criticize you. I feel this has to be perceived as a film and it shouldn't get into controversy because of its political background because you need to have guts to make this film and I must say our director and producers have the guts. 'The Accidental Prime Minister' is a biographical political drama film, presented by Rudra Production (UK), Bohra Bros in association with Dr Jayantilal Gada (Pen India Limited). It is directed by Vijay Ratnakar Gutte and written by Mayank Tewari. 'The Accidental Prime Minister' will hit cinemas on January 11.